After crossing railroad tracks Chemawa Rd turns left at the light. You will see a Gazebo on the edge of the parking lot park on the west side of the Gazebo. Turn left onto a gravel road (Note: just before Jones Produce Store) and proceed to the school. Park in the lot and walk to the south side of the building. Turn right onto Waconda Rd NE and drive east. On your right will be a LARGE hop field (lots of poles & wires) at the end of this field .5 mile (sign with RED arrow) on pole to the north side of the road... Turn Right onto the GRAVEL road (sign with RED arrow) stay on road (PLEASE DRIVE SLOWLY 5 MPH - make NO dust) until you come to a “T” turn left (sign with RED arrow) on pole, proceed past the BROWN building on left, past round silos (on left) then to the corner of the TAN building (on left) and stop on the grass (runway) next to the “wind sock” on pole. Park your vehicle on the DIRT road next to the hop field on your right... OFF the grass runway. Get on Chemawa Rd N. (note) After crossing railroad tracks Chemawa Rd turns left at the light. Continue westerly on Chemawa for 3.1 miles, you will hit a 4 way stop, continue on, a large orchard on your left will appear…slow down!! You will see a SMALL sign (boat ramp) at the end of the orchard next to a chain link fence. Take the paved road for about a ¼ mile through the orchard to the paved area parking lot (boat area) proceed and park on the left side (east) toward the River end (south) close to the restroom building end of the lot. You will see a sign for Champion Life Center park in the lot. Turn right onto Wolverine St. NE Park in the parking lot. This launch site is located on the south edge of Salem. Take exit 252 from I-5 and head West on Kuebler Blvd. Turn right at Rite Aid and park in their parking lot. Continue across the river and take right ramp onto Wallace Rd N, get into Left lane. Proceed on Wallace Rd approx. 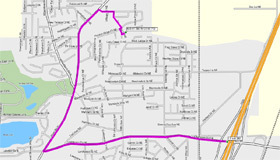 0.6 mile you will cross Orchard Heights Road. At the top of the hill you will see a Large open field on the left and a sign for WESTGATE ASSEMBLY of GOD Church turn into their parking lot.